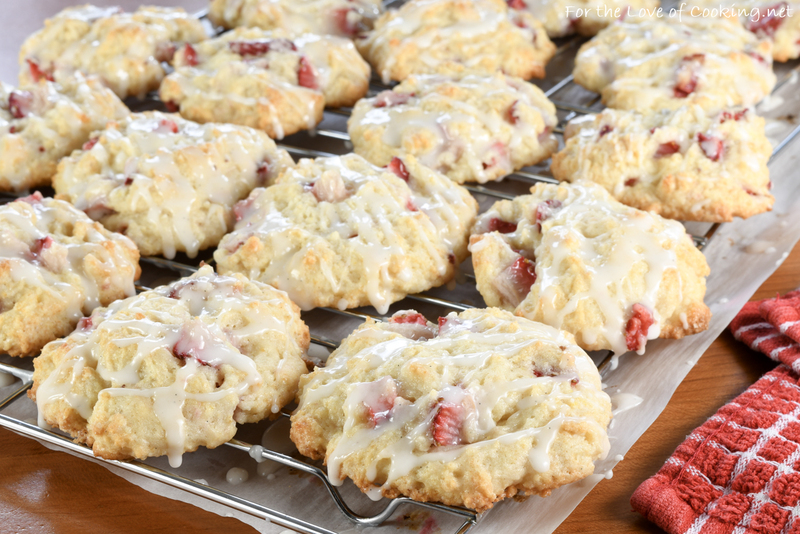 I love that these strawberry shortcake cookies with vanilla glaze have all the flavors of strawberry shortcake in one handy cookie. The texture reminds me a little bit of a crisp muffin top and I love that. These cookies were a fun recipe to make and they taste so amazing! The batter used Greek yogurt instead of eggs and milk which I loved and made me feel like they were a little healthier. The cookies were a big hit with my kids (and their friends) and will make delicious school lunch treats for this week. I tried one last night and fell instantly in love! They are wonderful. Place strawberries, lemon juice, 2 tablespoons flour, and 1 1/2 tablespoons sugar into a small mixing bowl; toss together until evenly coated. Set aside to allow flavors to mingle. Combine together the 2 cups of flour, 1 cup of sugar, baking powder, baking soda, and salt in a large bowl. Cut in the butter until a fine and grainy texture forms. Add the Greek yogurt and vanilla then mix until just combined – add an additional tablespoon or two of Greek yogurt if the batter is too dry. Fold in the strawberry mixture and lemon zest then mix until combined. Spoon 2 tablespoons of dough at a time, about 1 inch apart and place on the prepared baking sheet. Bake for 15-18 minutes or until the cookies just started to brown on top. Remove from the oven to cool for a few minutes before transferring them to a cooling rack to cool completely. Make the glaze by placing the powdered sugar, milk, and vanilla into a small bowl; mix well until creamy and smooth. 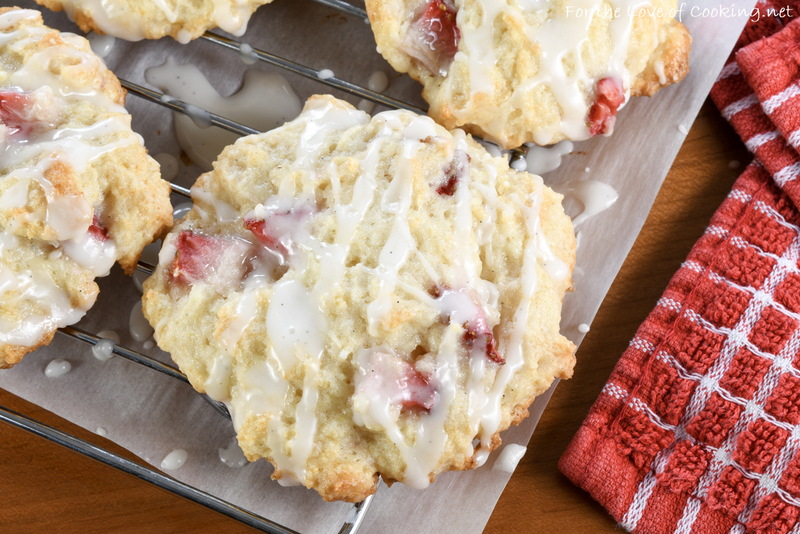 Once the cookies have completely cooled, drizzle glaze over them and serve. Enjoy! 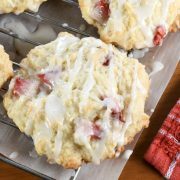 Place strawberries, lemon juice, 2 tablespoons flour, and 1 1/2 tablespoons sugar into a small mixing bowl; toss together until evenly coated. Set aside to allow flavors to mingle. Combine together the 2 cups of flour, 1 cup of sugar, baking powder, baking soda, and salt in a large bowl. Cut in the butter until a fine and grainy texture forms. Add the Greek yogurt and vanilla then mix until just combined - add an additional tablespoon or two of Greek yogurt if the batter is too dry. Fold in the strawberry mixture and lemon zest then mix until combined. Bake for 15-18 minutes or until the cookies just started to brown on top. Remove from the oven to cool for a few minutes before transferring them to a cooling rack to cool completely. 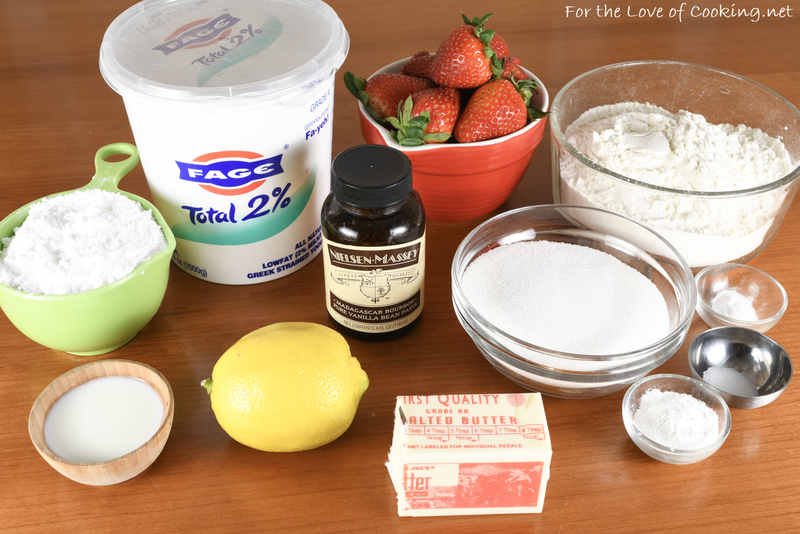 Make the glaze by placing the powdered sugar, milk, and vanilla into a small bowl; mix well until creamy and smooth. Once the cookies have completely cooled, drizzle glaze over them and serve. Enjoy! 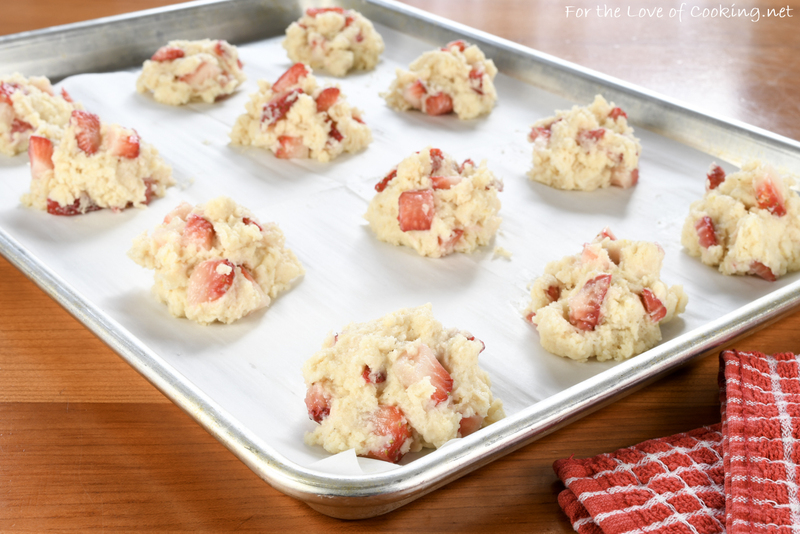 I love the add of fresh berries in these cookies! So much healthier that I can eat a few more without feeling guilty! Looks so yummy with strawberries ! I miss them! But think they are a it hard to find for me right now. I will go hunting though. I think blueberries or raspberries would work well. Here is a tasty blueberry/lemon cookie that is very similar and they are SO tasty. Looks very good Pam – I’m not used to hearing the word strawberry until early May. What a clever cookie recipe. They look fabulous. No wonder the children liked them. We all know muffin tops are the best parts of muffins, so this is a perfect cookie! Pam I baked those cookies today and they turned out fabulous! I baked this recipe today, and it was amazing. The whole family loved these cookies! Thank you for sharing! !